Once you have saved the IIF file download to your computer you can import it into your QuickBooks company file. From the QuickBooks File menu select Utilities. In the pop out menu select Import. In the next pop out menu select IIF Files. Locate the IIF file on your computer and click Open. Click OK to confirm that your data was imported. The journal entry imported is supported by (ties back to) the Revenue Snapshot. Note: The money that you received from your families is imported into a QuickBooks account called Undeposited Funds. This is done so that you can direct those monies into the appropriate bank account(s) in your Chart of Accounts with the Deposit function. 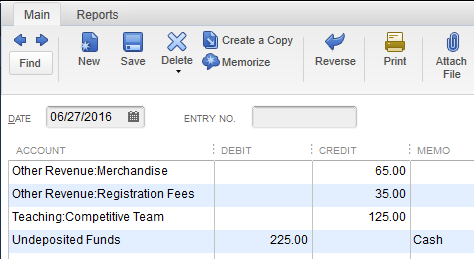 Jackrabbit is not able to offer support for your QuickBooks product. Please refer to their documentation or support desk for further assistance.